FILE - Muslim pilgrims circle the Kaaba, the black cube at center, inside the Grand Mosque during the annual pilgrimage, known as the hajj, in the Muslim holy city of Mecca, Saudi Arabia. The Islamic State group is extending its reach in Saudi Arabia, expanding the scope of its attacks and drawing in new recruits with its radical ideology. Its determination to bring down the U.S.-allied royal family has raised concerns it could threaten the annual Muslim hajj pilgrimage later this month. So far, the extremist group's presence in the kingdom appears to be in a low-level stage, but it has claimed four significant bombings since May, one of them in neighboring Kuwait. And it has rapidly ramped up its rhetoric, aiming to undermine the al-Saud royal family's legitimacy, which is rooted in part in its claim to implement Islamic Shariah law and to be the protectors of Islam's most sacred sites in Mecca and Medina that are at the center of hajj. An attack last month in which IS claimed responsibility appeared to mark a significant spread in the group's reach. Militants claiming loyalty to the group had already carried out three major bombings — two in eastern Saudi Arabia in May and one in Kuwait City in June, all targeting Shi'ite mosques and killing 53 people. 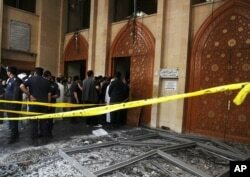 FILE - Security forces and officials gather at a Shi'ite mosque after a deadly blast claimed by the Islamic State group that struck worshipers attending Friday prayers in Kuwait City, June 26, 2015. But on Aug. 6, a suicide bomber attacked in western Saudi Arabia, hitting a mosque inside a police compound in Abha, 350 miles south of Mecca, killing 15 people in the deadliest attack on the kingdom's security forces in years. Eleven of the dead belonged to an elite counterterrorism unit whose tasks include protecting the hajj pilgrimage. 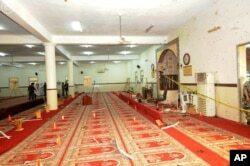 FILE - In this photo released by the Saudi Press Agency SPA, Saudi officials and investigators, background, check a mosque inside a police compound after a suicide bombing attack in of Abha, the provincial capital of Asir, Saudi Arabia, Aug. 6, 2015. The alleged affiliate that claimed responsibility for the August attack called itself the "Hijaz Province'' of the Islamic State, its first claim of a branch in the Hijaz, the traditional name for the western stretch of the Arabian Peninsula where the holy cities are located. The previous attacks were claimed by the group's "Najd Province,'' the traditional name for the central heartland of the peninsula and the homeland of the al-Saud family. Lori Boghardt, Gulf security analyst at the Washington Institute, said it would not be surprising if IS militants tried to take advantage of the hajj to stage an attack, particularly since the group has encouraged lone wolf operations. This year, the hajj begins Sept. 21 and is expected to draw some three million Muslims from around the world. "The kingdom is a holy grail of sorts as a target from the perspective of ISIS because of its significance to Muslims,'' she said, referring to the group by its longer acronym. A direct attack on pilgrims carrying out the hajj rites — potentially causing large casualties or damaging holy sites — may be a risky move for IS, bringing a backlash from shocked Muslims worldwide. Still, the group "has made it very clear they have no red lines,'' said Nazer, a senior analyst at the Virginia-based consultancy and security firm JTG Inc. 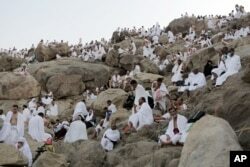 FILE - Muslim pilgrims gather to pray at Jabal al-Rahma holy mountain, or the mountain of forgiveness, during the annual pilgrimage, near Mecca, Saudi Arabia, Oct. 3, 2014. But there are other potential targets, including security forces in or around Mecca. The group could attempt to hit pilgrims from Shi'ite-majority nations like Iran, who would stand out since pilgrims generally move in groups by country. IS and other Sunni radicals consider Shi'ites heretics. Little is known about the structure of the Islamic State group in Saudi Arabia. It is not known if the militants in the kingdom have direct operational ties with the group's leadership based in its self-declared "caliphate'' in Iraq and Syria — or if they simply operate independently in the group's name. In all four attacks claimed by the branches in the kingdom, the bombers were young Saudis, suggesting the group's ranks are largely homegrown as opposed to foreign militants. The bomber in the August attack was identified as Yousef Suleiman, a 21-year-old Saudi with no record of ever having travelled abroad, pointing to the group's ability to radicalize even youth who have not gone to join fighting in Syria. "If you are looking at IS as a state, the territory it controls is not going to vastly expand, but the ideology it espouses is expanding,'' said Hani Sabra, head of Middle East practice at Eurasia Group. Since Syria's civil war escalated over the past four years, Saudi Arabia's ultraconservative clerics urged young men to go fight alongside Sunni rebels in Iraq and Syria. Concerned about possible radicalization, the late King Abdullah last year banned fighting abroad or encouraging it. But by then, some 2,500 Saudis had already gone to Syria. The Interior Ministry says around 650 have since returned and that they left disillusioned with the fighting. This year, Saudi Arabia and other Gulf countries joined the U.S.-led campaign of airstrikes against IS in Syria. In an Aug. 24 audiotape, an IS supporter denounced the royal family as "tyrants'' ruling Islam's heartland without implementing what IS calls its true teachings. Saudi Arabia is already run by one of the most ultraconservative interpretations of Shariah, known as Wahhabism. Some of its clerics view Shi'ites as heretics, are virulently opposed to monuments or tombs they see as encouraging idolatry, believe in a strict segregation of the sexes and support the use of religious police to enforce Shariah rules — all teachings not far from the Islamic State group's ideology. But Wahhabi clerics make a crucial distinction, preaching that the recognized ruler — in this case, the al-Sauds — must be obeyed. They condemn protests or violence that could lead to instability. The kingdom's highest religious authority, Grand Mufti Sheikh Abdulaziz al- Sheikh, denounced IS and al-Qaida as Islam's number one enemy. He said the holy sites are protected by a force specifically dedicated to the task and a large number of additional security forces will be deployed during hajj to ensure pilgrims' "security and safety'' and manage the traffic of the large crowds. He also pointed to the elaborate security system of surveillance cameras and helicopters that the kingdom implements each year. He could not give exact figures or specify whether the deployment would be larger this year. The kingdom has also arrested hundreds of suspected militants this year. Overseeing that effort is Crown Prince Mohammed bin Nayef, who is also interior minister and led the battle that eventually crushed al-Qaida's branch in the kingdom in 2006. 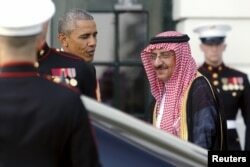 FILE - U.S. President Barack Obama greets Saudi Arabia's Crown Prince Mohammed bin Nayef as he plays host to leaders and delegations from the Gulf Cooperation Council countries at the White House in Washington, May 13, 2015.